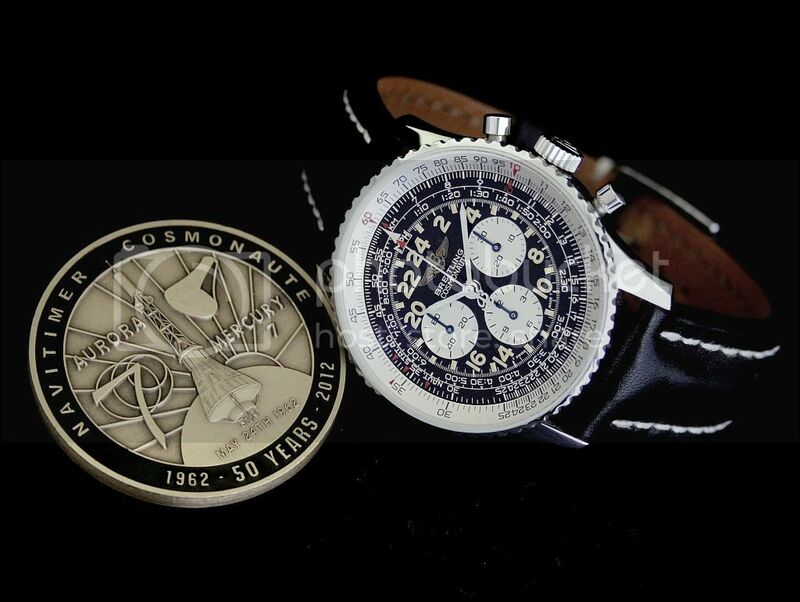 The Cosmonaute began life over forty years ago as a 24-hour version of the much-loved Navitimer pilot's watch. The following year it was worn in space during the second orbital flight by an American astronaut. Sadly, when the time came for NASA to choose the watch to be issued to astronauts for the later flights leading up to the first moon landing in 1969, and beyond, the Cosmonaute was not in the running. 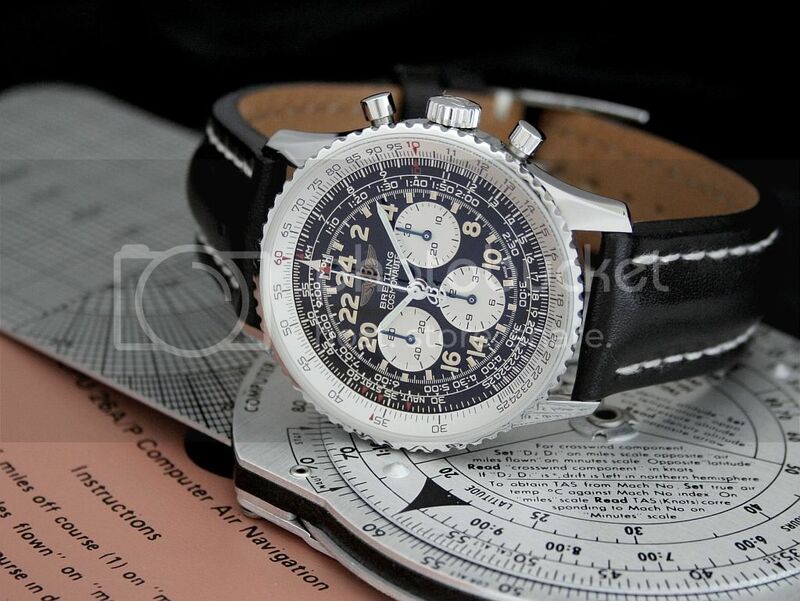 Ironically, one of its most desirable and iconic features, the slide rule, precluded the water and air tightness thought by NASA to be so necessary for a watch to be issued for use in a low-pressure environment; the Cosmonaute and the 12-hour Breitling Navitimer were not seriously considered. The watch that won the honour was of course the Omega Speedmaster, a watch without the low case-hermeticity of the Breitlings. And it was the Lémania 1873/1877 movement as used in the Speedmaster that was chosen by Breitling to power the revised Cosmonaute from the 1980s until it was updated to the current automatic flyback version. In 1959 Lt Cmdr Scott Carpenter was selected as one of seven astronauts for the NASA Mercury program. Carpenter was a US Navy test pilot who had flown in combat in the Korean war and who wore a Breitling Navitimer (12-hour version) during the 1950's. 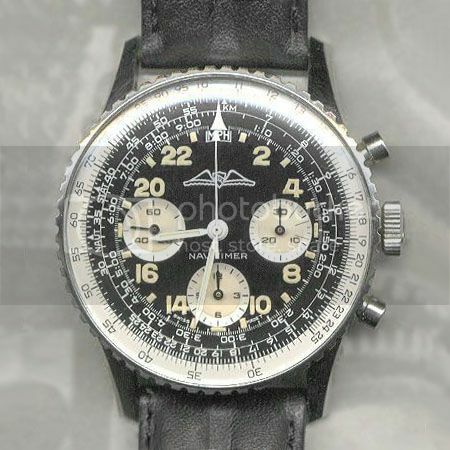 After selection he contacted Breitling and suggested they make a 24-hour version of the Navitimer pilot's watch. 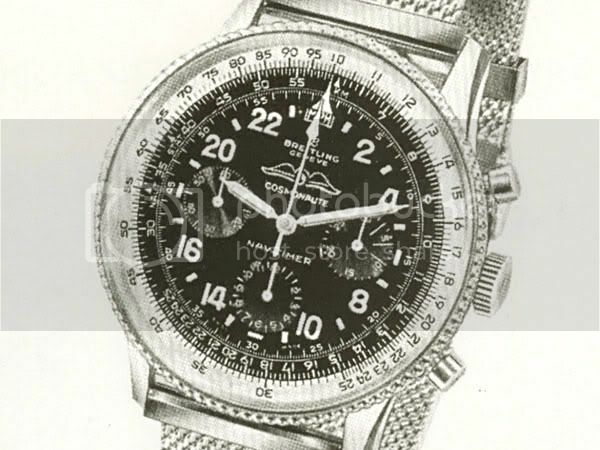 In 1961 the 24-hr Navitimer was introduced. 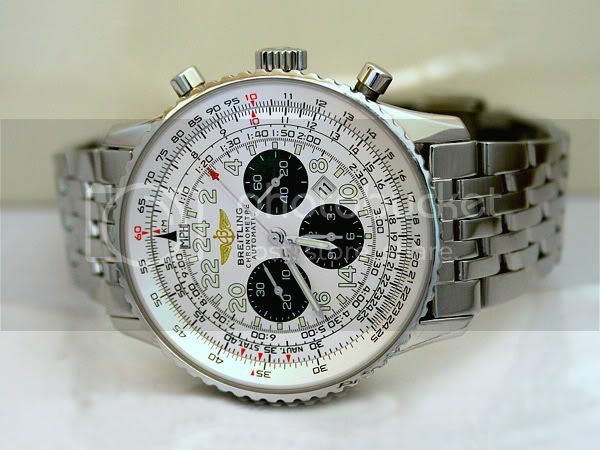 It had the usual Navitimer model reference number 806 and like the 12-hour version had the Aircraft Owners and Pilots Association (AOPA) wings logo on the dial. Apart from the 24-hour gearing, the movement was the same Venus caliber 178 as in the 12-hour Navitimer. The Venus star logo and '178' can be seen under the balance wheel. 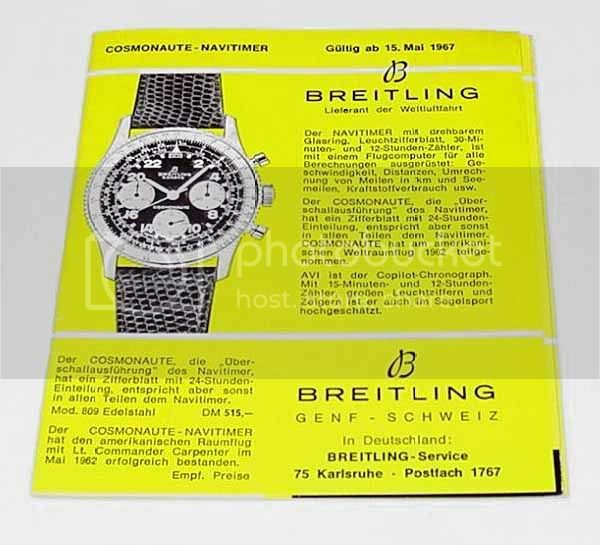 In June 1961 the name "Cosmonaute" was registered by Breitling with the Swiss Office of Intellectual Property and it is believed that manufacture of the Cosmonaute, model reference 809, began during that year. However the name "Cosmonaute" did not always appear on the dial. 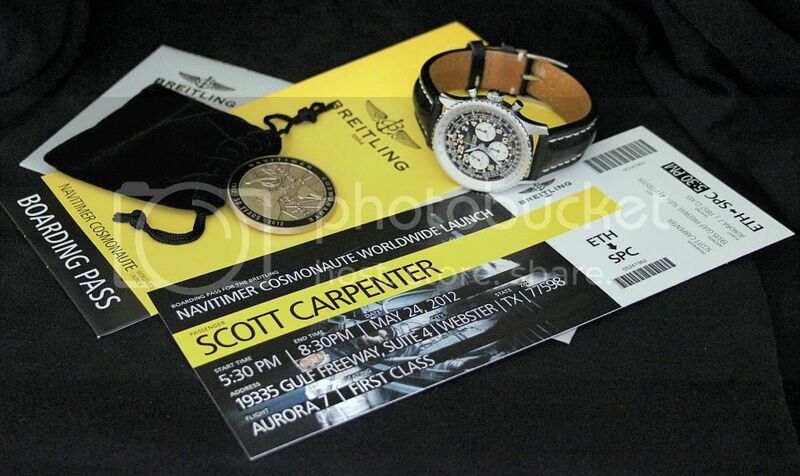 Scott Carpenter eventually received his own 24-hour Breitling on the 21st May, 1962 just three days before his historic flight. Lt Cmdr Carpenter orbited the Earth over three times at a maximum distance from Earth of 164 miles. After a flight lasting just under 5 hours, splash-down was in the Atlantic approximately 1000 miles south-east of Cape Canaveral. Unfortunately during recovery Carpenter's left arm was submerged, damaging his non-waterproof watch which after examination by NASA experts was sent off to the Breitling company. The historic watch was never returned and sadly its present whereabouts are unknown. By 1962 the model reference of the 24-hour Navitimer had become 809 and it is generally accepted that the ref 809 is a "Cosmonaute" no matter what is written (or not written) on the dial. There were various permutations of dials/bezels during the 1960’s. Some were named 'COSMONAUTE', some 'NAVITIMER' and some watches had both names on the dial. Some watches had the old 'B' logo and/or the AOPA wings, and some the 'twin planes' logo. Sometimes the words 'BREITLING' and/or 'GENEVE' appeared. Cases were available in steel, gold-filled with stainless steel back, and 18K yellow gold. The gold-filled and 18K watches had hands to match and the dial-printing was partly gold in colour. The AOPA logo was either printed or gilt. There were also variations in the red-printed numbers and markers on the slide rule scales which were also sometimes printed in black or white. (Some of these dial variations were being released simultaneously, so a Cosmonaute with a later serial number could have an earlier dial design than a watch with an earlier serial number. Further research may help clarify the full extent of dial variations and their dates of release). Breitling used Scott Carpenter’s Mercury 7 achievement in their publicity. The watch shown had an all-black dial as did the one Carpenter wore in the Mercury capsule. During the "transition" period of 1962/63 the all-black dial was being superseded by the new silvered subdials design. This advertisement appeared in Life and Newsweek magazines although the appearance of the watch was revised shortly afterwards. This 1963 Cosmonaute has the same dial as in the advertisement although it has no luminous on the hour numerals and has the newer style hands which may have been fitted at a later date. This watch has a later serial number than the 1962 silvered subdials example shown earlier. A German advertisement ca 1962/63 shows the silvered subdials and new design slimmer hands with the old 'beaded' bezel. The lizard strap was fitted to most Cosmonautes and Navitimers in the 1950s and 60s. 1964 gold-filled Cosmonaute ref 809 with gilt AOPA logo. The bezel is the new style that replaced the previous 'beaded' bezels. 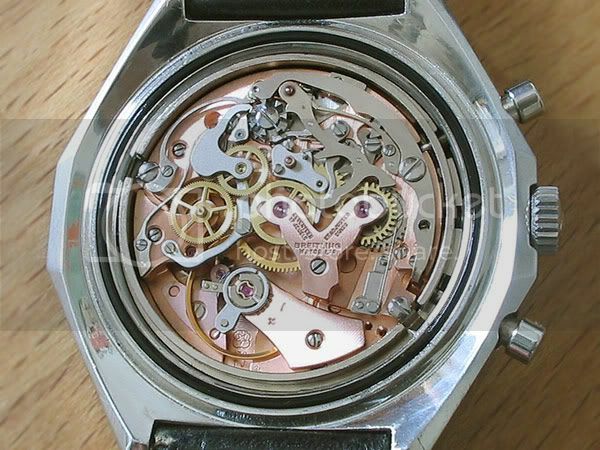 In 1967 as well as Venus 178-powered ref 809 Cosmonautes, there was a very rare variation of the ref 809, the 809-36 with the Valjoux 7736 movement. Externally the watch looked the same as the usual Venus-powered version except for the model reference on the case back. Case-back detail from a Cosmonaute ref 809-36. The serial number dates this example to 1967. 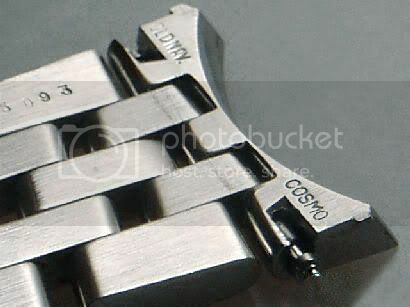 There was also another reference used, '809 E' for Cosmonautes that had the Valjoux 7736 movement. The author has not so far been able to establish any further information on the 806-36 and 806 E and would appreciate anything that could be added to this article - thanks. Another rare design from 1967 appeared in a german brochure. This 1967 German brochure shows a dial with neither the 'twin planes' nor the AOPA wings. If this dial design actually existed it is very rare. All production ceased at Breitling. The company was in difficulties due to the crisis in the Swiss watch industry caused by the advent of cheap quartz watches, mainly from Japan. Willy Breitling was old and ill and so the company was sold bringing to an end the ownership and involvement of three generations of the Breitling family. Mr Ernest Schneider bought the Breitling company name and certain rights but the right to manufacture the existing Cosmonaute and Navitimer models (but not the name 'Cosmonaute') passed to Mr Helmut Sinn. Ollech and Wajs also acquired certain rights and a large stock of watch parts including movements and cases. These would be assembled and sold by O & W mostly as part of their 'Aviation' range of pilot's watches. A few were still available new in 2005 although they were essentially 1970s watches. A new replacement dial was offered by Breitling for the 1960s-70s Cosmonaute ref 809. It had large sub-dials and a slightly different twin planes logo than the original. The new dial uses Luminova rather than the original tritium although it is marked 'T SWISS MADE T'. 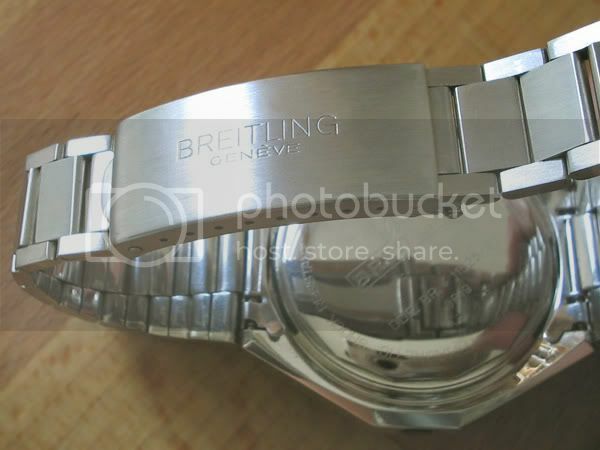 As this is a genuine Breitling replacement part, it can be the best option for a watch with a badly deteriorated dial. A totally new design of Cosmonaute in both manual and automatic versions had been under development for some time and the manual Cosmonaute ref 819 was introduced. The ref 819 used the same Venus 178 movement as the previous ref 809. Manufacture of the automatic version, the ref 1809, began during 1968 but it was not yet on sale. The automatic Cosmonaute Chrono-matic ref 1809 was released in March, the first automatic chronograph ever, beating the Zenith El Primero to the market by a few weeks. Partly because the name 'El Primero' means 'The First' a myth has grown that the Zenith El Primero was the first automatic chronograph but this is not strictly true. (The Chrono-matic movement is modular; the El Primero was the first integrated automatic chronograph movement). The earlier Cosmonaute Chrono-matics had black dates. Later they were mostly red although black date wheels did continue to be used as well. The bezel design of both the manual ref 819 and the automatic ref 1809 were soon modified to a more practical version not prone to the black coating being chipped or worn from the edges. The case backs are marked "DDE. BR. + 11525/67" which refers to a 1967 patent for the design of the case and bezel with the circular slide rule controlled by a cogged mechanism. It is this that enables the watch to have some measure of water resistance even though the rotating slide rule scale is beneath the crystal, an area normally inaccessible from the outside of a waterproof watch (except for access via the crown and pushers). 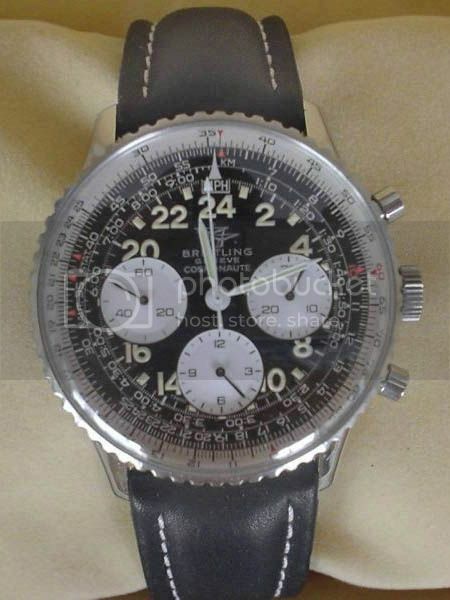 Interestingly, a similar system with a geared rotating bezel mechanism driving the slide rule was used decades laster in the Breitling B-1, B-2 and Bentley models. 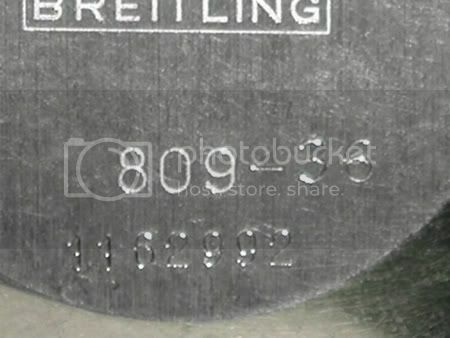 The serial number (beneath the model reference 0819 or 1809) is etched rather than stamped and can disappear if the case back is polished (as in the ref 1809 example above). 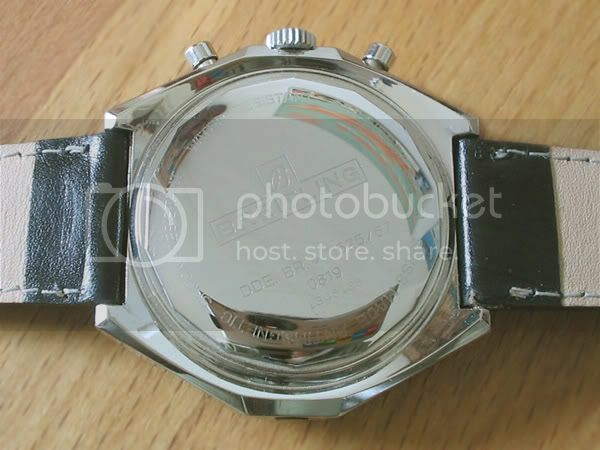 It is common to see big case Cosmonautes with this number barely discernable or even completely removed and this should not normally be interpreted as a dishonest attempt to hide the serial number (for example of a stolen watch). 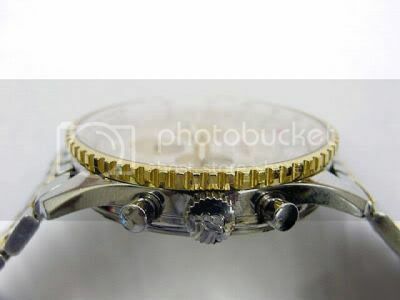 Owners of these watches should advise their watchmakers to not on any account polish the back of the watch! The big case Cosmonautes are designated 'waterproof to 5 atmospheres', a pressure equating to a depth of 165 feet/50 meters. Confusingly, the quoted water resistance of a watch is not the actual depth it may safely be taken to. While a big improvement on the non-water resistant ref 809, a watch with this level of resistance is in fact only safe for swimming in shallow water, and even then only if it has been pressure-tested within the last, say 12 months. Due to the layout and construction of the automatic movement, the ref 1809 has a most unusual feature; its crown is on the left. However, the same watch case was used for both the manual and automatic versions and had holes drilled at 3 o'clock and at 9 o'clock. These holes were used as appropriate for the ref 819 or ref 1809 for either the crown or for access to the patented bezel drive mechanism. The ref 819 has a plugged hole where the crown of the 1809 would fit which could be removed for servicing of the bezel mechanism. Likewise the 1809 has a plug in the right side between the pushers where the crown of the 819 would fit. 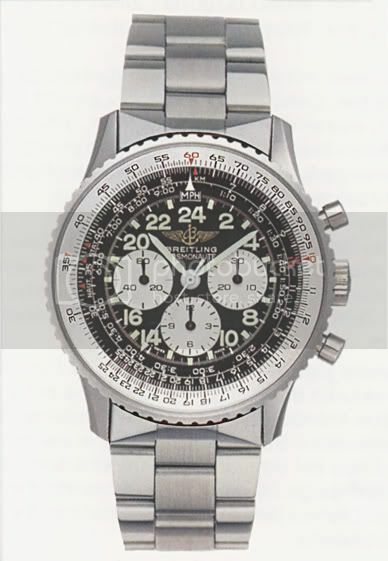 The Breitling 'No. 14' bracelet was an option for several models including refs 819 and 1809 during the 1970s. 1968-manufactured 819s were still being sold new as late as 1973. Note: Some model references had suffixes that referred to dial variations or other options. From circa-1990 there was also a prefix letter referring to the metal used for the case and bezel. For our purposes here, the suffixes have generally been ignored and for convenience the prefix 'A' is used (means 'acier', French for stainless steel). Generally comments regarding steel watches also apply to the other metal options. The new Breitling company under Mr Ernest Schneider (father of the current head of the company, Mr Theodore Schneider) began developing many new models, among them a Cosmonaute, ref 81 600 (there is also an equivalent Navitimer with the same ref 81 600). The new Cosmonaute ref 81 600 was much closer in spirit and design to the original ref 806/809 than were the 'big case' watches of the 1970s; the 81 600 feels more like the natural successor to the first Cosmonautes. The Cosmonaute ref 81 600 is powered by the Lémania calibre 1977 or calibre 1973 modified for 24-hour use (both were used by Breitling). Initially this hand-wound movement had 17 jewels but later had 18. 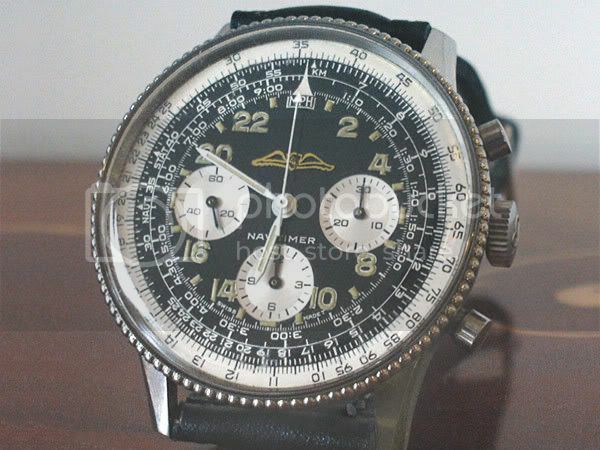 Model 81 600-24 was listed as 'Old Navitimer Cosmonaute'. It was available in steel or 18 carat gold. The steel version had a black dial with silver sub-registers and could be supplied with either a leather strap or a steel 3-links wide bracelet. 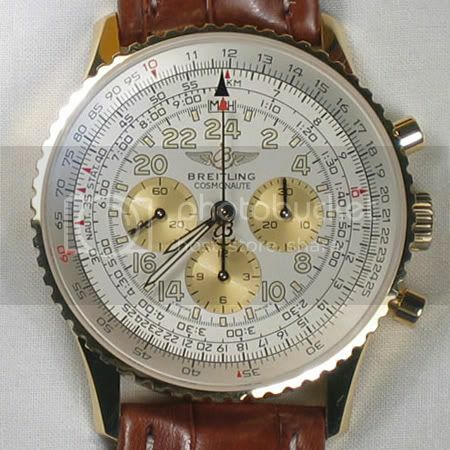 The gold Cosmonaute could be ordered with a silver dial with gold registers and was only supplied with a leather strap. New model references were introduced for the 1991 model year: A12019 for steel; or K12019 for all 18K gold. The mineral crystal was anti-glare coated. The 1992 model had mineral glass with anti-reflective coating on both sides. 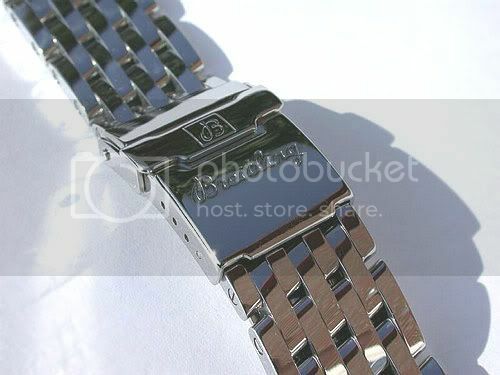 The old 3-links-wide bracelet was replaced by the new 5-links wide Pilot bracelet although some watches were still supplied with the older bracelet. The gold version was fitted with a crocodile strap with an 18K buckle. The Cosmonaute was by now available in steel with an 18K gold bezel with the reference D12019. The watch was revised and renamed the ‘Cosmonaute II’. It was now water-resistant to 30 metres; the central sweep seconds hand had a letter ’B’ on the short end; the glass was now sapphire, anti-reflection coated on both sides; the watch was available in steel ref A12020; steel/18k gold ref D12020; or all 18K gold ref K12020. For the 1995 model year, the ‘II’ was dropped from the name which reverted back to plain ‘Cosmonaute’. A new dial colour, blue was introduced as well as the previously available black and silvered dials. The new model reference was A/D/K12022 for the normal back version. The steel case versions were available with a display back, similar to the ref 12021 Serie Speciale for the Japanese market the previous year. The new model reference was now A12023 or D12023. 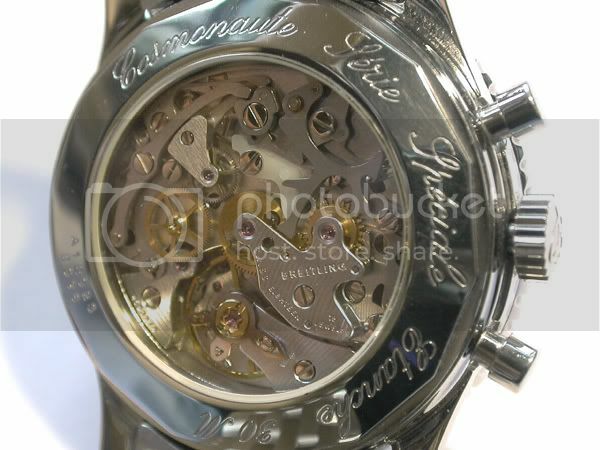 The display back is popular with collectors as the highly regarded Lémania movement can be admired. However, there is a piece of plastic in there which can be disconcerting when owners first spot it! Most if not all 1990s Cosmonautes have the version of the Lémania 1873/1877 movement with this 'Delrin' brake which is technically better although obviously aesthetically less nice. I say 'most' as there were some slight variations in this movement as installed by Breitling in late 1980s and early 1990s examples and I do not know for certain that all Cosmonautes originally had the Delrin part. 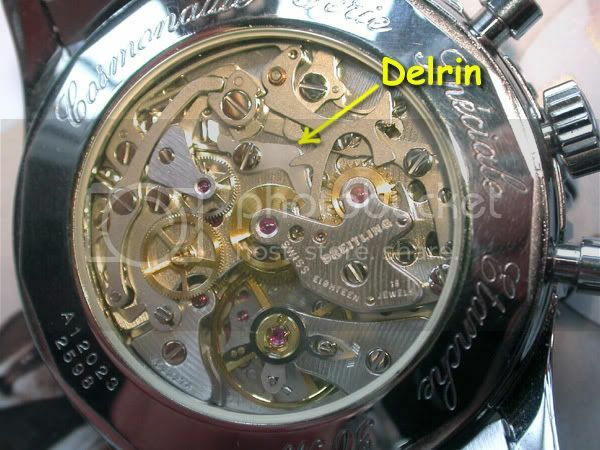 At the time of writing (2005) Breitling will replace the Delrin part with a metal one during a service on request. However Delrin, a product manufactured by Dupont S.A., has properties superior for the purpose to those of metal. In the picture below, the chronograph has first been started by pressing the upper pusher, and now stopped by pressing it a second time. This second pressing has caused the Delrin brake to push against the fine-tooth centre seconds wheel (see how the bottom right of the 'dog-leg' Delrin part is touching the wheel). When the lower pusher is finally pressed in order to zero the chronograph hands, the brake will swing out from the fine-toothed wheel ready for the next use of the chronograph mechanism. 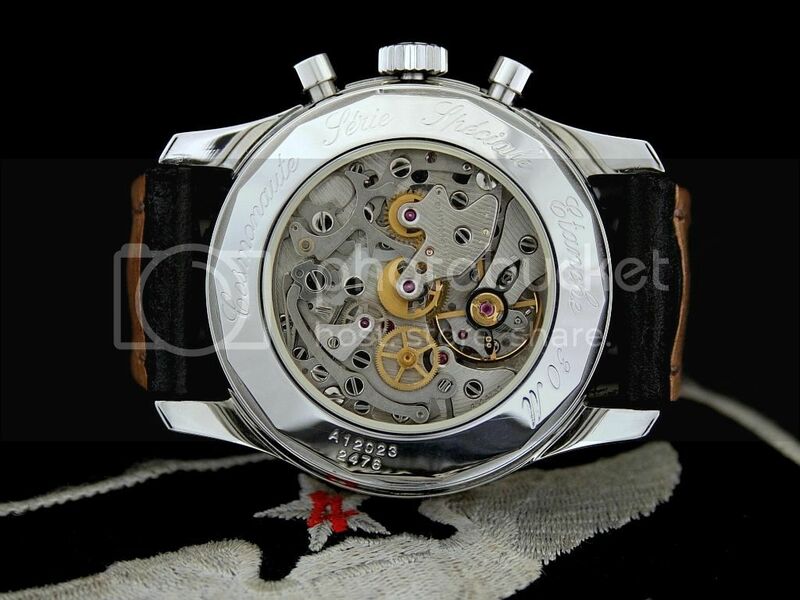 It is interesting to note that Omega, who also used this Lémania movement, replaced the Delrin brake with a metal one in watches with display backs. However Delrin does seem to me to be a better material for the brake than metal. A new bracelet, the 7-links wide 'Navitimer' became available as well as the 5-links wide 'Pilot' or a leather strap. The 'Navitimer' bracelet was available in the three versions to match the metal of the watches. A special series of one thousand Cosmonautes, the ‘Scott Carpenter’ model was introduced. 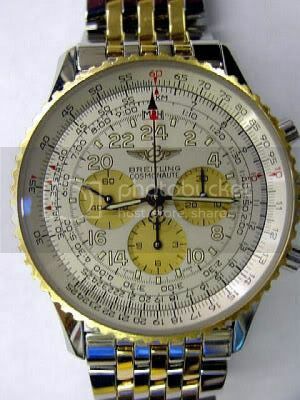 It has ‘Breitling’ in traditional script and ‘SCOTT CARPENTER’ on the dial. The special Mercury 7 Aurora back features the design from the official 1962 mission patch at its centre. 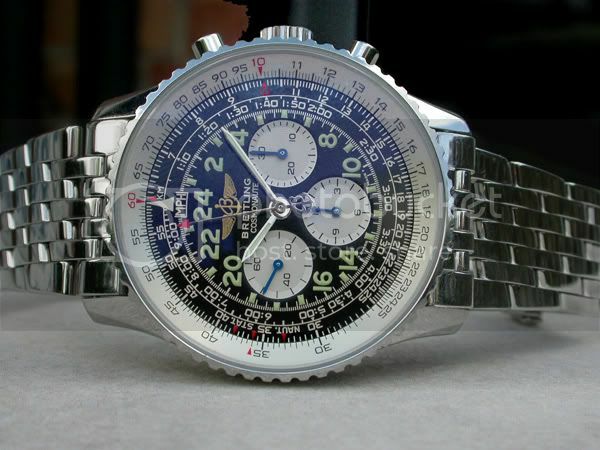 The Pilot bracelet was discontinued for the Cosmonaute and Old Navitimer watches. The design of the clasp of the 'Navitimer' bracelet was updated. New design 'Navitimer' bracelet clasp. 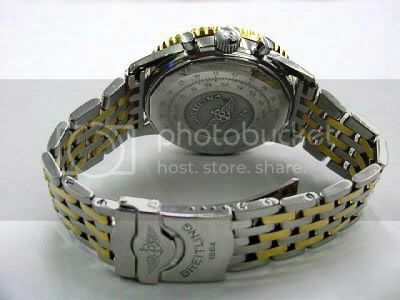 At first, in 1997 the new clasp had the Breitling wings and "BREITLING 1884" on it. 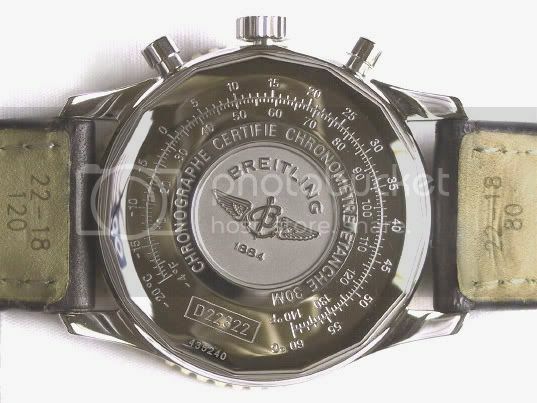 Then a year later it was updated again with a "B" and "Breitling" as in this picture. The Scott Carpenter model was officially discontinued although as it was a fixed run of 1000 watches one presumes they must have remained on sale until all were sold. The movement was now COSC-certified and the model reference therefore became A/D/K12322. Apart from this the rest of the watch remained the same as before. Cosmonaute ref A12322 with silver-coloured sub-dial hands. Some ref A/D12022 and A/D12322 Cosmonautes were delivered with these hands. They were usually replaced with blued hands when serviced. The Lémania movement Cosmonautes were discontinued due to difficulties in obtaining the movement from the parent company of Lémania, Swatch Group. The Cosmonaute was now fitted with a new automatic movement, the Breitling caliber 22 with flyback function and date. The B22 is modular, based on the ETA 2892A2 with a Dubois Depraz chronograph module. 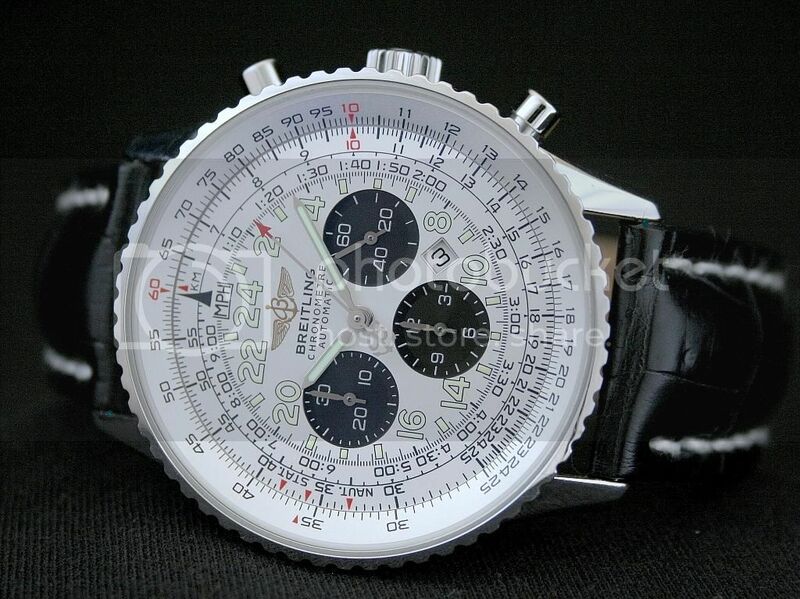 Initially the new watch was named the ‘Cosmonaute Flyback’. 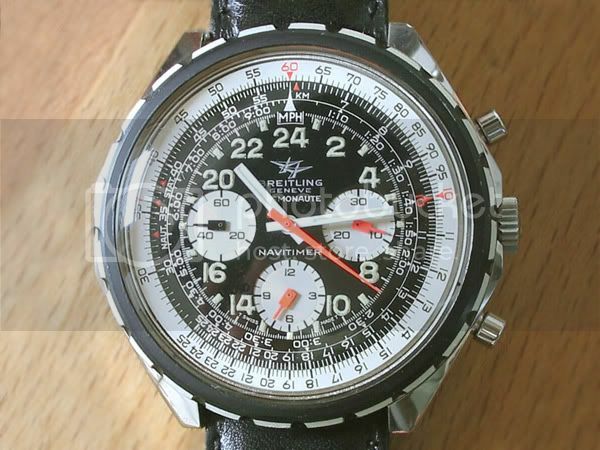 The words on the dial, read ‘BREITLING CHRONOMETRE AUTOMATIC’. The model reference was A22322 and the movement was automatic with date, flyback function, and like all Breitlings by this time was a COSC-certified chronometer. Chronometer certificate supplied with a Cosmonaute ref A22322. 'Montre No.' is French for 'watch number' and is the serial number stamped into the back of the watch. The Cosmonaute Flyback was available in steel; steel and gold; 18K yellow gold; or 18K white gold. The available dial colours for the steel and the 18K white gold Cosmonaute were black or anthracite with silvered sub-registers or silvered with black sub-registers. The steel and gold Cosmonaute had the choice of black or anthracite with silvered sub-registers or silvered with gold sub-registers. The 18K yellow gold version had a black dial with gold printing and silvered sub-registers. (The blue dial option of the previous A12322 was not available for the A22322). For the 2003 model year the word Flyback was dropped from the model name although the watch remained identical to the previous year and retained the flyback function; once again the watch was known as plain ‘Cosmonaute’. And that's the end of the story for now... many thanks to all contributors! Thank you for reading this article and please remember, any further info or images will be most gratefully accepted! 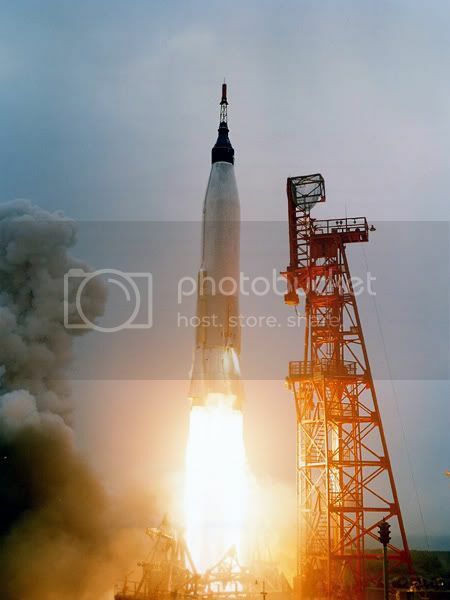 21.12.05 Additional infomation about Scott Carpenter added (with thanks to David Bryant who discussed the Mercury program and Breitling watches with Carpenter in 1993). There will be further information added from this source. Copyright © 2005/2006/2007/2008 Alan Trott. All rights reserved. Last edited by O2AFAC67; June 20th, 2013 at 19:25. Reason: to add more information and images. nikola0406, Dennis Smith, vegasvince and 6 others like this.